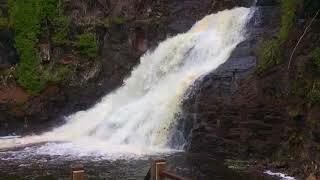 This Superior Hiking Trail spur provides access to Caribou Falls and can also be accessed from the Caribou Falls State Wayside parking lot on MN-61. The trail will lead you through beautiful forests alongside the Caribou River to a rough metal staircase brings runners down to the bottom of a gorge. Once at the bottom of the gorge, you can drop your stuff and enjoy the base of a beautiful waterfall. The Beautiful Caribou Falls in Slow Motion.